Political leaders are notorious for the dossiers they put together on people they're meeting. 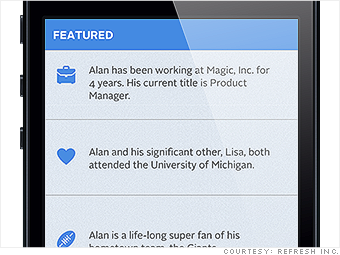 Now, business travelers can get that kind of information for free on their iPhones. Refresh pulls info from various social media sites to give tidbits on those you're meeting, like if they recently took a big trip, bought a new car or went to the same college. "When you have the right information, you can make interactions so meaningful," says Bhavin Shah, cofounder of Refresh, which raised $10 million this month from investors. The app also links up with Evernote, so any notes you make on the meeting -- or the person -- can easily be transferred.